Our regulars will remember our coverage of MBHC from last month, We put the stock on our radars beginning on July 20th and tracked it to a really nice initial run from .0041-.0096 (+134%). 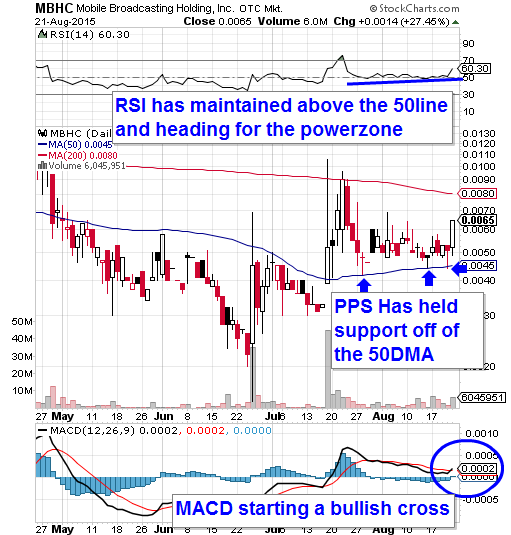 Since then the stock consolidated a bit, and for the past few weeks, has been trading in a relatively narrow channel from around .0045-.0065, holding support off of its 50DMA the whole way. At the time of our active coverage of MBHC, we were looking forward to the launch of the company’s mobile, real-time video broadcasting platform, known as the Whirld app. BETA testing has been underway, and this morning, we’ve received another update on the tentative date of the official launch, so we thought it would be a good time to begin monitoring the stock again. The stock is gapping down heavily this morning, so we’ll continue to watch Put contracts in the DE options chain with strike prices close to the money. In the event of a continued PPS decline, we could still see some good opportunities on the bearish side of the fence.